Another winter has come and gone making way for Spring. The snow will be melting and the short, cold days will be replaced with long warm evenings. What does this mean for photography? Well the frosty mornings will be swapped out for even earlier sunrises, beautiful green landscapes, nesting birds and of course spring fishing. 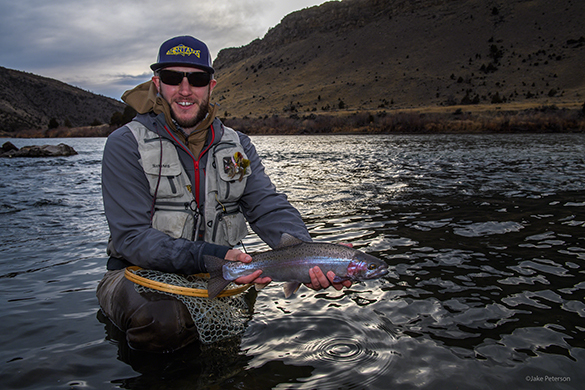 My friend Dan holds up the last of the spawning Rainbows, soon to be on the reds to make future years of rainbows. This was a quick click with the D5, 24-70 AF-S and SB-5000. The changing of the season affects everything including photography. If you’re thinking subjects to photograph this spring make sure to do your homework now before April gets here.